Tis the season for meadows full of beautiful native wildflowers, such as this tall ironweed, Vernonia gigantea. Various goldenrods, asters, and other flowers of fall are starting to come on strong, too. While a flower-filled field may look peaceful, in reality scores of wee killers lurk among the blooms. A flower can be a very dangerous place for a nectar-seeking pollinating insect. 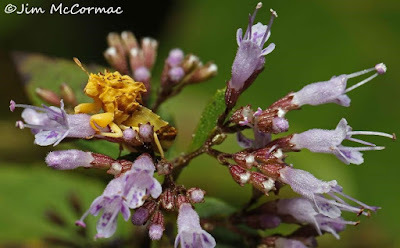 I did a pretty intensive field trip through several southeastern Ohio counties last weekend, and managed to find a number of specimens of one of my favorite killers in the flowers, the Jagged Ambush Bugs in the genus Phymata. 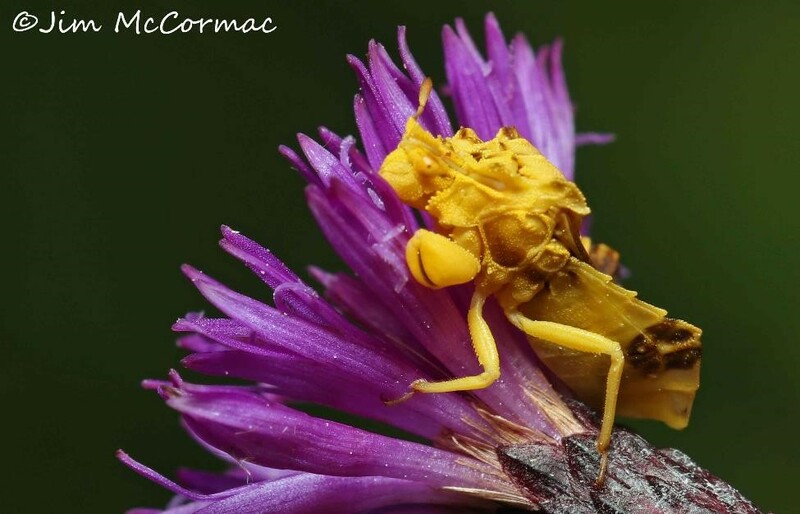 An ambush bug sits, rather uncharacteristically conspicuously, on the magenta flowers of ironweed. It is like a little gargoyle. Note the powerful raptorial forelegs. If a small bee, wasp, fly, or anything that can be overpowered lands here, it is likely doomed. With a quick lunge, the ambush bug will seize the victim, and then punch it with a syringe-like proboscis. Toxins in its saliva quickly immobilize the victim, and digestive enzymes rapidly decompose its innards. When a nice, slushy consistency has been reached, the ambush bug slurps out the contents. 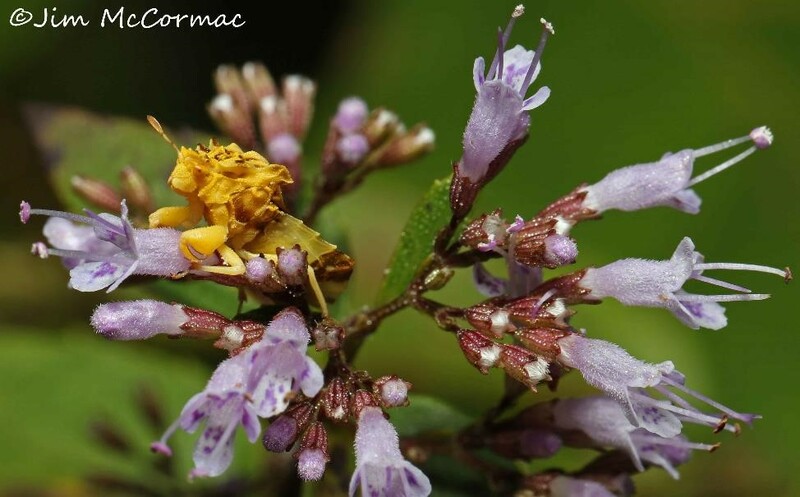 The keen observer of Jagged Ambush Bugs soon notes that they come in an array of colors. I have read that at least some species can change color, chameleonlike, to match the flowers that they hunt in. I do not know for sure if that is true, but it makes for a good story. The animal in the photo above is nestled in the flowers of boneset, Eupatorium perfoliatum. Boneset, ironweed, and goldenrod are surefire bets for finding these interesting predators. Ambush bugs are very small and easily overlooked. Once one has developed an eye for them, they're easy to see and you might be surprised at how common they are. I found this little chap to be in an especially showy setting - the flowers of a wonderful little mint known as dittany, Cunila origanoides. I dropped to the ground and spent 10-15 minutes with my camera trained on the ambush bug, hoping some luckless pollinator would fly in and get whacked. It was not to be while I was there, but given the number of tiny bees and flies in the area, I'm sure plenty of meals are scored. The genus Phymata is not especially large in North America north of Mexico - 20 species or so - and diversity thins out even more east of the Mississippi. Apparently nearly all of the ones in Ohio and vicinity fall into three species: Phymata americana, P. fasciata, and P. pennsylvanica. Separating these species can be quite difficult, especially from photos, so I'm just leaving it at that. This ambush bug hit the jackpot! It has killed a comparatively massive tachinid (tak-in-id) fly, illustrating the potency of the debilitating neurotoxin that it injects into victims. 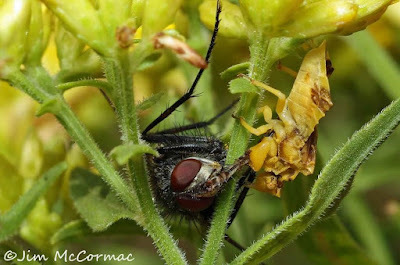 Not only did the elfin bug quickly KO the larger fly, it then drug it from the flowers and down into the plant, where it was better hidden. The kill shown here is a great irony; karmic payback? Tachinid flies are parasitoids, laying eggs on hosts such as caterpillars and katydids. The fly egg hatches a tiny grub which quickly bores into the host and commences eating it alive. The fly maggot feeds and grows within its victim, ultimately killing it. This tachinid has met its match in this ferocious little ambush bug. 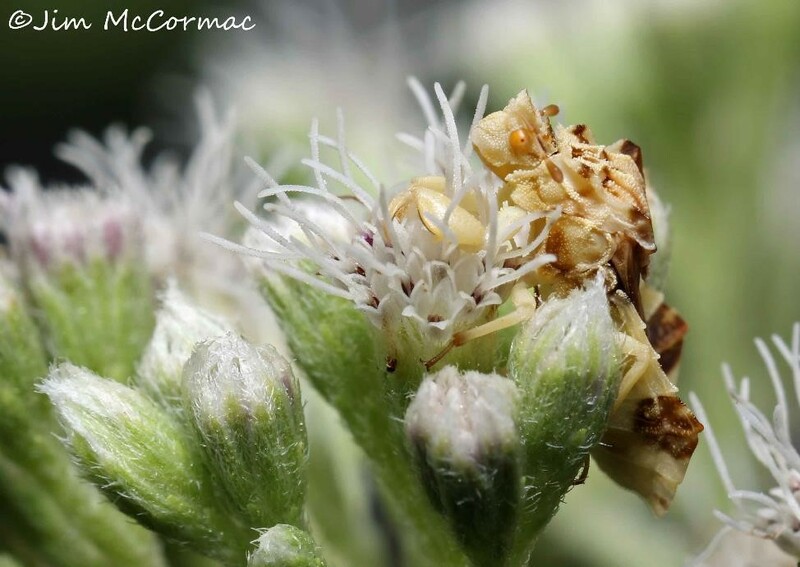 Keep an eye on the flowers this fall, and I'll guarantee you'll spot a Jagged Ambush Bug sooner or later. The entrance to the main building at Stratford Ecological Center in Delaware County, Ohio (iPhone photo). I had the pleasure of visiting last Thursday afternoon, and speaking to the corps of volunteers that make this place tick. Or at least some of them - the volunteer ranks number about 180 people! It was a great time, and I got to see and spend time with some wonderful people that I don't see nearly enough of. After my talk concluded, a bunch of us went outside for a stroll around the property to see what we could see. We didn't make it far. Basically, a nearly two hour loop that started at the sign in the photo, and ended there. We only made a big circle around the building, despite starting with more grandiose intentions! But the walk's shortness was dictated by all the critters we saw in just that brief distance. I'll share some of them below. First, a note about Stratford. The property encompasses about 236 acres, which includes meadows, woodlands, and wetlands. The photo above is from a vernal pool workshop back in 2011. Some of the best vernal pools remaining in central Ohio are on the property, and in spring they teem with salamanders, frogs, and myriad other life forms. In fact, early spring, at night, is usually the only time I ever see Stratford - when the amphibians are running. It was nice to spend some daylight hours there. 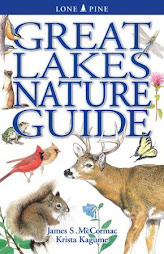 About 14,000 visitors annually come to learn about nature here, and a great many of them are school-aged. The site is worth its weight in gold for natural history education. The number of visitors just keeps increasing, demonstrating the value - need! - for places such as this, where people can get away from the hustle-bustle and into a tranquil biodiversity-filled place. Consider visiting, and especially if you live in the central Ohio region, becoming a supporter. Read all about Stratford Ecological Center RIGHT HERE. Anyway, I had every hope that we might make it to the woods with the vernal pools on our hike. But it was not to be - it seemed that every shrub and tree held some object of interest, and before we knew it, our time was up and we had only circled the administration building. As soon as we gathered to head off, this handsome Potter Wasp, Monobia quadridens, flew in to entertain us as it nectared on a flower-potted Sedum. Its appearance was apropos, as I had just lectured on caterpillars and their role in the big-picture food web. Potter Wasps prey on caterpillars. NOTE: While I usually do macro work with a full-frame Canon 5DS-R, the image above and those that follow were created with the crop-sensor Canon 7D II. It is a highly competent camera for macro, and about any other kind of shooting. The lens was the 100mm f/2.8L macro, and illumination was via the Canon 600 speedlite muffled by a Lumiquest softbox. A "caterpillar-hunter wasp" Eremnophila aureonotata, gorges on nectar from an amazingly robust Hoary Mountain-mint, Pycnanthemum incanum. As you'll have deduced, the wasp also preys on caterpillars. David Hoy, Stratford's Development Director, eventually directed us over to this shrub of a mint. The sheer number of pollinators was beyond belief! Butterflies, wasps, bees, beetles - dozens and dozens of animals. Close in on a Two-spotted Tree Cricket, Neoxabia bipunctata. It is one of the many "singers" that contribute to the insect soundscape of late summer and fall. A Great Spangled Fritillary, Speyeria cybele, taps nectar from clover. Back to the giant mountain-mint and a gorgeous Gray Hairstreak, Strymon melinus. Two of these suave little butterflies were working over the mint's flowers. A rolled up leaf of a Spicebush, Lindera benzoin, gave away the bivouac's occupant. We carefully unrolled the leaf to admire the caterpillar of the Spicebush Swallowtail, Papilio troilus. On the building's porch were some mustards of some sort being grown for food. And food they were, for some interesting caterpillars. This one is the larva of the Cabbage White butterfly, Pieris rapae. It's the ubiquitous little white butterfly of gardens and fields nearly everywhere. Also noshing on the mustards were a number of these handsome tubular fellows, the Cross-striped Cabbageworm, Evergestis rimosalis. Like the Cabbage White, it is an import from foreign lands, but thrives here courtesy of our nonnative mustard plants. No matter its origin, the cat is quite handsomely marked. Seeing the cabbageworms reminded me of a story from last year. We had a mini-conference on caterpillars in September 2015, based at the Eulett Center in the midst of the Edge of Appalachia Preserve in Adams County. We had hired a caterer to do the meals, and while we were looking at and photographing caterpillar livestock in the center while awaiting Saturday's lunch, he suddenly appeared at my side. "Mr. McCormac" he whispered, "there's a problem with the salad. Worms are in the kale! It's taking us a while to pick them out." "Worms!" said I - "let me see these 'worms'"! Sure enough, Cross-striped Cabbageworms were in the kale and doing their best to eat it all before we had a crack at the green stuff. The photo above is of two of those very caterpillars. Well, this was a wonderful opportunity and we brought out some of the salad-eating caterpillars for the group to admire. Everyone was pleased to see these handsome larvae and many photos were made. After the salad-stealing caterpillars had been removed from the greenery, the salads were consumed with no qualms or grumbling by anyone. I think that our caterpillar conference attendees were probably the only group on earth that would have reacted favorably to this insect intrusion. And I'm sure the chef was pleased that we weren't upset, and probably also thought us to be weirdos of the highest order. A friendly public service announcement on behalf of America's flower flies (family Syrphidae). Those little bee-like insects (such as in the photo) that sometimes land on you are not bees. They are valuable, pollinating flies that do a good job of mimicking bees. While they do have a tendency to land on people's skin - seeking minerals in your sweat - they cannot sting, bite or otherwise hurt you. Pancaking them, or dousing one's self with insect repellent is not necessary. I only say this because I've seen about six people in the last week overreacting to the "aggressive bees". Apparently it was of help to the flies, as the message got a lot of attention. This experience got me to thinking about the broader picture of mimicry, one of my favorite subjects in all of natural history. 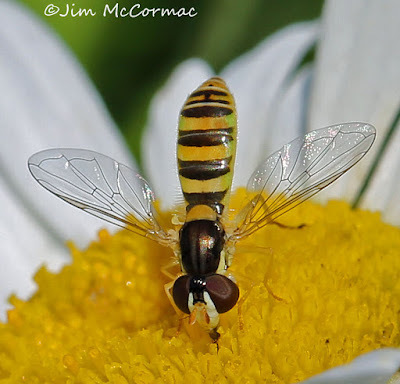 The flower fly (or hover fly) does a darn good job at looking like something that might sting, thus theoretically dissuading would be predators from attacking. 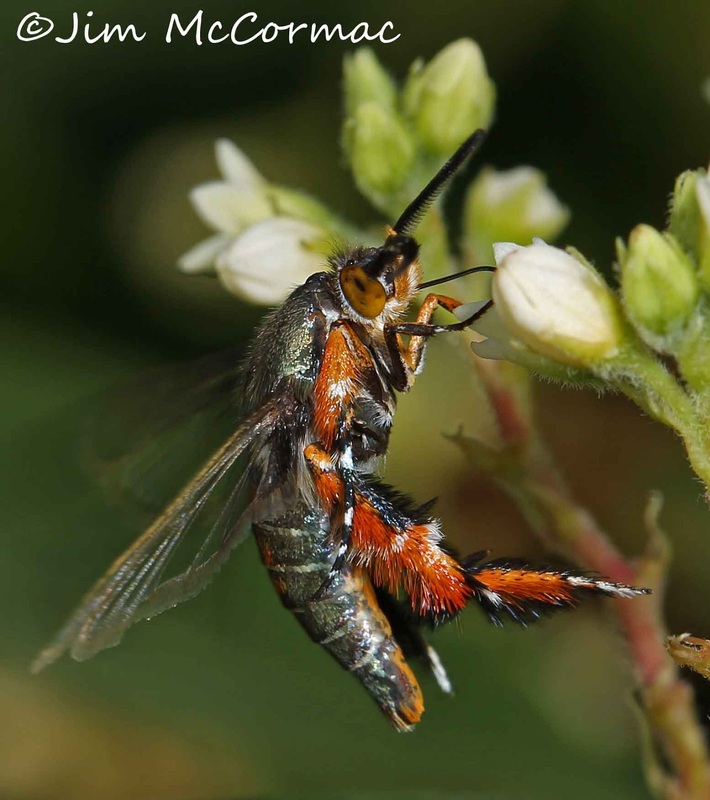 But flower flies are just the tip of the iceberg when it comes to insects mimicking the appearance of Hymenoptera (bees and wasps) that pack a punch. A homicidal looking "bumblebee" if there ever was one. This is a robberfly, Laphria thoracica, sitting on a conspicuous perch awaiting insect prey to fly by. When a suitable victim makes an appearance, the fly will whir out after it, grab the meal to be with spiny legs, and stab it with a syringelike proboscis. The fly then injects chemicals that paralyze the victim and speed in the decomposition of its innards, the latter of which will eventually sucked out via the fly's proboscis. Why look like a bumblebee? 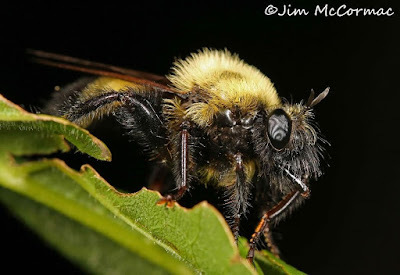 Possible because robberflies are prone to perching out in the open, and looking like something that stings may telegraph a message of AVOID to birds. If you weren't privy to this one, it'd make you head the opposite direction, perhaps. 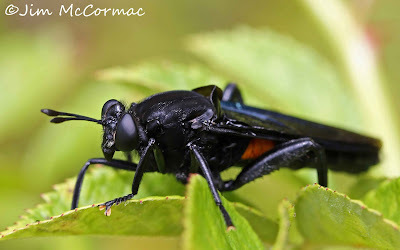 This is a very large fly known as a Mydas Fly, Mydas clavatus. 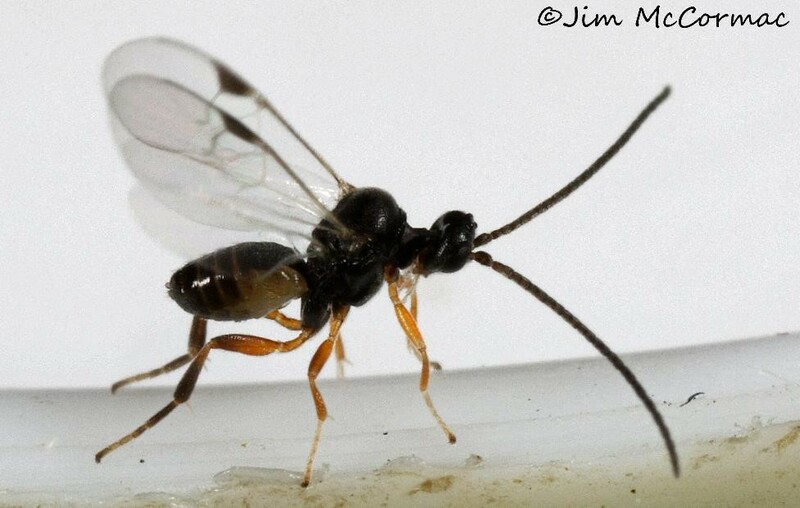 They greatly resemble large predatory spider wasps, but are completely harmless. Their larvae dwell in decomposing wood and are predators of beetle larvae. 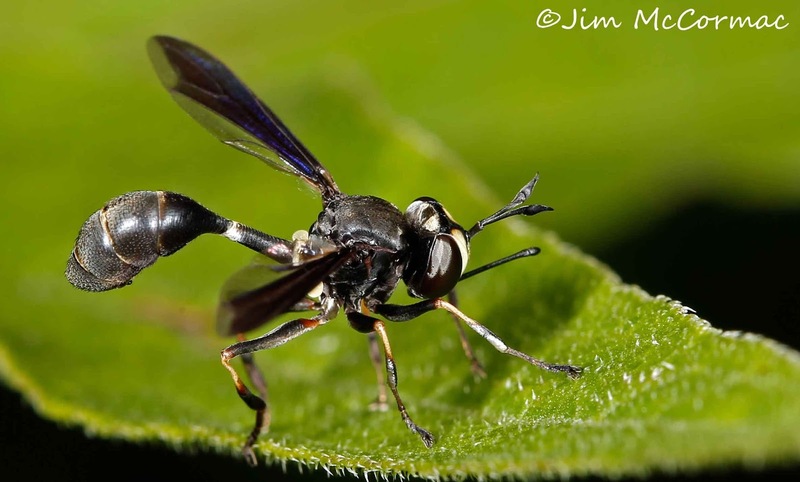 The ferocious looking wasp-mimicking adult flies apparently only take nectar from flowers. The first time I saw a Thick-headed Fly in the genus Physocephala (I think this is P. tibialis), it completely fooled me. I was sure it was a wasp. It has a waspish "waist" and thickened terminal abdomen, and even waves its front legs around when perched in the manner of some wasps. This species is reportedly a parasitoid of the bumblebee Bombus bimaculatus. Beetles are in on the let's look like something dangerous act, too. This is an Amorpha Borer, Megacyllene decora, and the adults really look like a hornet, especially in flight. 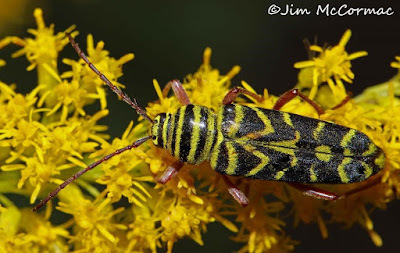 Another great hornet mimicking beetle, the Locust Borer, Megacyllene robiniae, which is common on goldenrods in fall. Even moths - yes, MOTHS! - get in on the act. This is the Eupatorium Borer, Carmenta bassiformis (I believe). 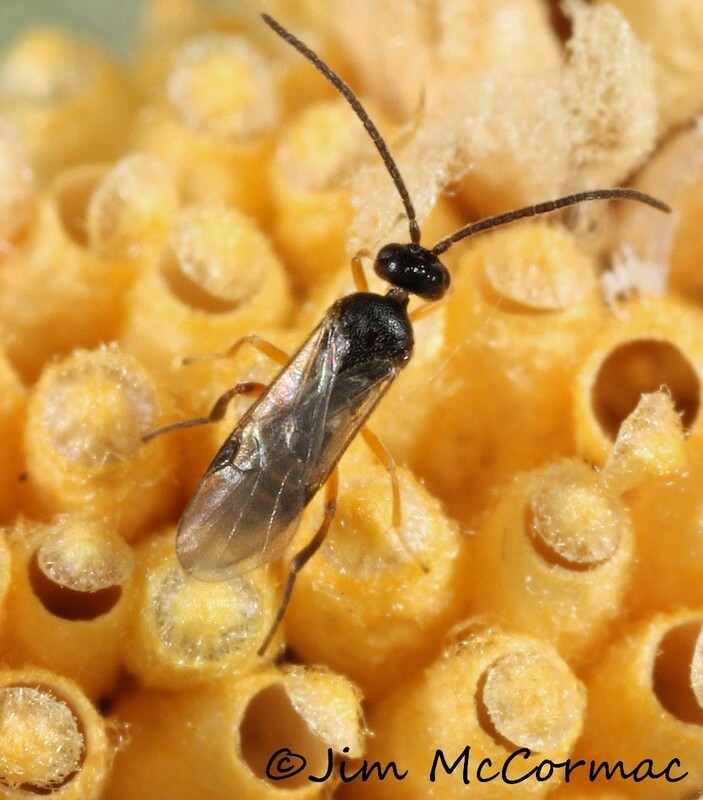 It, and its fellow borers in the family Sesiidae are fabulous actors, greatly resembling bees and wasps. A Squash Vine Borer, Melittia cucurbitae, visits the flowers of dogbane, Apocynum cannabinum. This day-flying moth would fool just about anyone into thinking it is some sort of wasp. It even dangles is its legs, which are thickened with brushes of hair, as it flies just as many wasps do. Here we have a dragonfly, of all things, seemingly mimicking the look of a bee/wasp/hornet sort of thing. This is a female Elfin Skimmer, Nannothemis bella, the smallest dragonfly in North America. Only the female apparently employs the mimicry; males look very different. She even twitches her abdomen when at rest, in the manner of some bees. When seen in the field, the effect is strikingly wasplike. Finally, at the end of this short list of mimicry examples is the utterly bizarre mantisfly known as Climaciella brunnea. Squint your eyes a bit and ignore some of the odd appendages, and this thing is the spitting image of paper wasps in the genus Polistes. These wasps certainly pack a punch, and I'd imagine potential predators learn a painful lesson if they try and capture and eat them. 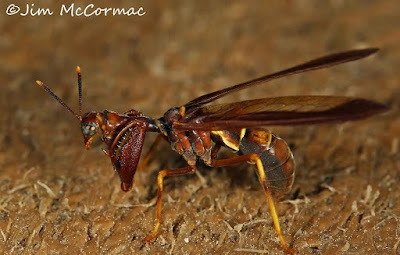 If you can look like a paper wasp, a la this mantisfly, they'll presumably leave you alone too. 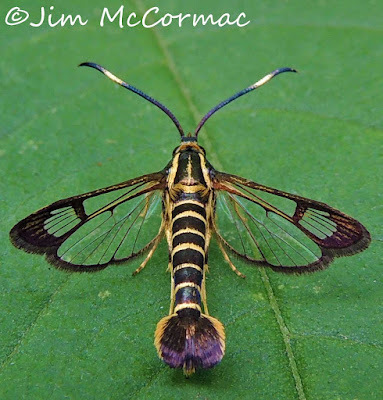 Mantisflies are a story in their own right, and I've written about them HERE. Sometime I'll have to write about all the creatures that mimic bird droppings. NOTE: Sometimes people ask me why I pick certain headlines for my columns. The answer: I don't. Editors craft newspaper headlines, not the reporters and writers. Howard is a technician for General Electric and naturalist extraordinaire. Wagner is a professor at the University of Connecticut and author of the "Caterpillars of Eastern North America" (Princeton, $29.95). We had been conducting field work in this Ohio River county. When we found the moth, it triggered a discussion about the fabulous diversity of these winged creatures. If we could expose more people to the wonders of moths, we reasoned, more people would become enamored with natural history. A call to Mary Ann Barnett, a natural-history enthusiast and organizer extraordinaire, bore fruit. She was instrumental in shaping the conference. By early 2013, our moth-centric conference was ready and slated for a June weekend. We hoped to attract perhaps 30 to 40 diehards. In all, about 150 attended the inaugural event, far exceeding expectations. That first conference was based at the Lodge at Shawnee State Park, smack in the midst of biodiversity-rich Scioto and Adams counties. The following year we moved to Burr Oak State Park in Morgan County, and the third and fourth conferences have been back at Shawnee. The most recent Mothapalooza took place the first weekend of August, with another full house. 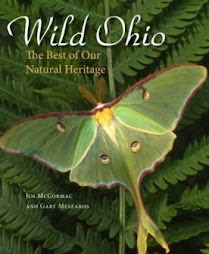 Some of the region’s premier moth experts shared their knowledge with participants, and generous sponsors, in particular the Ohio Department of Natural Resources' Division of Wildlife, provide critical support. 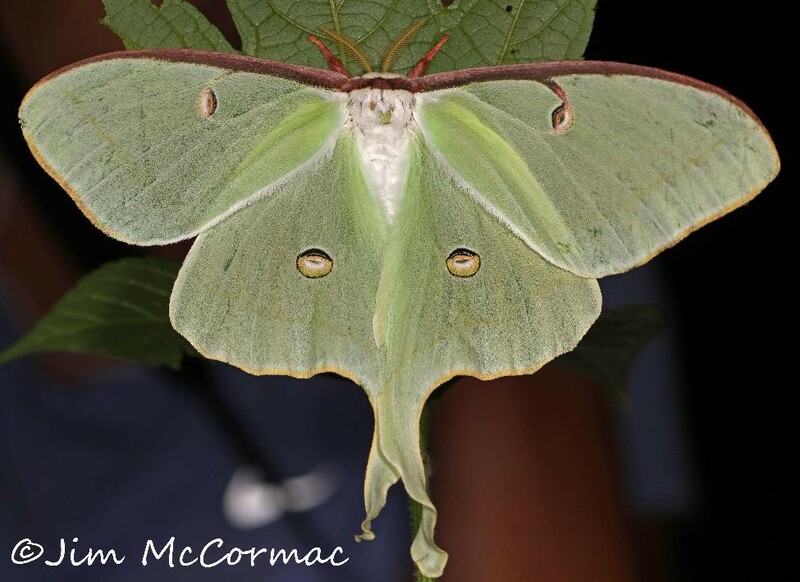 Although Mothapalooza features wonderful speakers, vendors, artists and others, field trips to see moths are the core of the conference. Nocturnal excursions on Friday and Saturday nights departed at 9:45 pm, and some attendees didn't return to the lodge until 3:00 am. We have to keep moths’ hours. Moth stations are situated in the wild lands of Shawnee State Forest and adjacent Edge of Appalachia Preserve. A station consists of hung sheets illuminated by specialized lights. They’re irresistible to moths, which fly to the sheets for easy observation. Perhaps 1,500 moth species occur in this region, and their diversity is dazzling. Species range from bat-sized imperial moths to micro moths scarcely visible to the unaided eye. The collective cast is painted in a rainbow of other colors. Two major factors have spiked interest in moths. In 2012, the "Peterson Field Guide to Moths of Northeastern North America" was released, exposing a huge new audience to the magic of moths. The meteoric growth and increased accessibility of digital cameras is the other factor. Moths are fabulous subjects, and relatively easy to photograph. Many images from Mothapalooza 2016 can be found at my blog. For more information, visit www.mothapalooza.org. Naturalist Jim McCormac writes a column for The Dispatch on the first, third and fifth Sundays of the month. 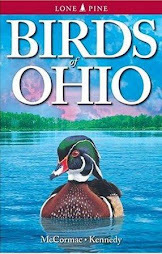 He also writes about nature at www.jimmccormac.blogspot.com . It'll be fun, and full of a wide array of interesting subjects. All levels welcome! Learning to get that camera off auto mode will do wonders for your photography, whether you use a point & shoot or an advanced SLR. CLICK HERE for workshop details and registration information. Feel free to email me - jimmccormac35 AT gmail.com with any questions. Last Saturday, August 13, the Midwest Native Plant Society sponsored a one-day workshop on pollinators. It was well attended, with over 140 participants. The speakers were great, fun was had, and there were field trips following the indoor sessions. The venue was the U.S. Army Corps of Engineers' fabulous visitor center at Caesar Creek Lake in Warren County. We really like holding events at this place, as the conference room is perfect for groups of up to 175 or so people, AND one only need step outside the doors to get into interesting habitat. As proof, one of our field trip leaders, John Howard (striped shirt, back to camera) shows a group a huge female Dobsonfly on the wall by the doors. There was also a stunning Cloudless Sulphur butterfly in the raised flower bed, near that rock. At the end of the day, a couple of us were poking around the woodland edge near the visitors center when I spotted a Redbud, Cercis canadensis. As this tree is often productive for finding various slug moth caterpillars, we went over to inspect its foliage. It didn't take long before I spotted one of our most striking caterpillars, the Saddleback, Acharea stimulea. It's always a crowd-pleaser. NOTE: The Saddleback in this photo is a proxy for the actual specimen that we found. I imaged the animal above two years ago in southern Ohio. Scroll on and you'll see why I used a substitute image to show what one of these cats looks like. Here is the actual Saddleback that we found on the Redbud last Saturday. It's dead, and its body bristles with the cocoons of a Braconid wasp. There are so many cocoons festooning the unfortunate cat's body that it took me a minute to realize what species we were looking at. To top off the predatorial assault, there are even a few tachinid fly eggs on the body for good measure. Braconid wasps and tachinid flies, among others, are parasitoids. 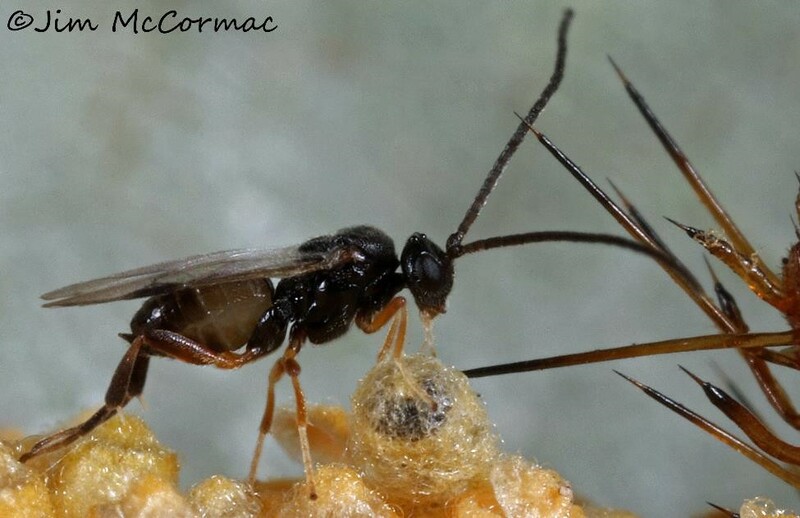 Parasitoid insects such as these generally kill their hosts. One of these flies or wasps lays its eggs on - or injects them into - the victim. The eggs hatch quickly, and the tiny grub begins boring its way through the host's body, consuming non-vital tissues at first. Obviously, as evidenced by the photo above, many such larvae might occupy a host. The parasitoids cleverly avoid consuming the organs that allow the caterpillar to continue to remain mobile and thus better elude other predators, such as birds. Finally, in a grisly last hurrah, the larvae finish off the victim and burst from the dead husk and spin tiny cylindric cocoons. 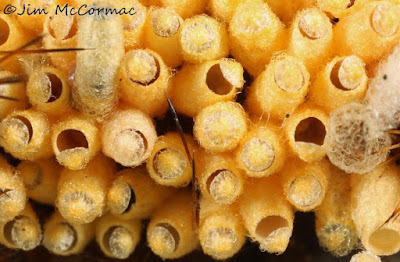 It takes a few days for the wasps to pupate and emerge from their cocoons. I saw an opportunity to attempt to make images of the emergence, and took the caterpillar and its gruesome hitchhikers and placed the whole shebang in a clear vial. I tried to check on the occupants every hour or so to see if anyone was hatching. Today (August 15) was the day. I had the vial in my office, and when I checked it around 10 am, a few wasps were flying about within. An inspection of the cocoons revealed that most appeared ready to hatch, but in spite of regular monitoring, no more emerged during the day. I left the office around 5:15, vial and camera in hand. When I reached my car in the parking lot, I took one more look before stowing everything. Probably two dozen wasps were flying about! Perhaps my moving the vial jostled them into action, I don't know, but I rushed back to the building to create some images of the wasps emerging. It doesn't take long for one to pop out. 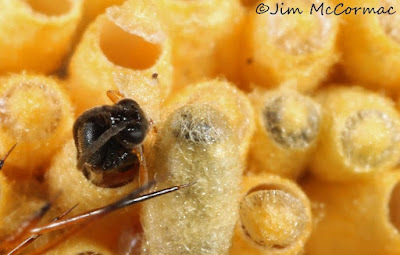 As the pupa matures into an adult wasp, the outer edges of the summit (lid) of the cocoon get thinner and more fragile. The wasp then apparently chews a very neat incision around the summit of the cocoon, and when the time is right, it pushes up and pops the lid off. From the time that I could detect an obvious movement of the lid in the case of the wasp above, it was probably only 30-45 seconds before it had broken completely free of the cocoon. The three cocoons to the right of the wasp still have their occupants. Other cocoons have the lids popped and we can see the almost perfectly circular shape of the lid. Just seconds after emergence, a braconid wasp takes stock of its new world. After a brief run-around, it took wing and vanished. Making images of these insects was not easy. The wasps are probably only 2-3 millimeters in length - smaller than can be effectively dealt with by using a "normal" macro lens such as my Canon 100 mm. Thus, I resorted to the tricky but useful Canon MP-E 65mm "mega" macro lens, which magnifies up to 5x life size. But this lens is not forgiving, and very hard to use on objects that are moving. It has no focusing system; the operator just moves the camera back and forth to focus. Depth of field is extremely shallow, even at f/16 (what these images were made at), and front of the lens flash is essential. And it is nearly essential that the camera be firmly braced in some way. But if all goes passingly well, we can see into a micro world that is far too small to be visible to the unaided eye. A wasp gives brief pause after a few wing shakes and a spot of grooming. An instant later it was gone. The spearlike spikes to the right of the wasp are part of the caterpillar's armament of stinging spines. 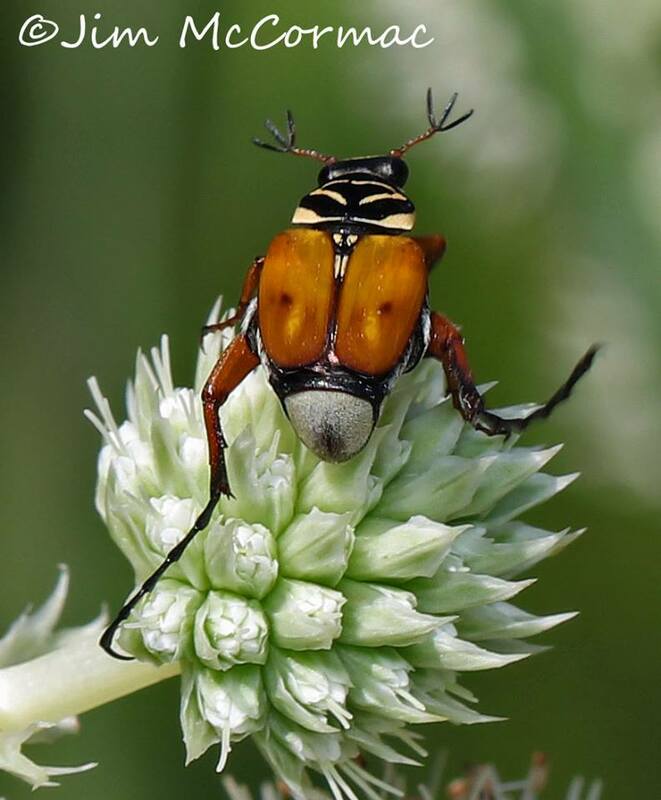 Saddlebacks are said to have a very painful sting, but while such weaponry may work on birds and other larger predators, it is not effective against small parasitoid insects. 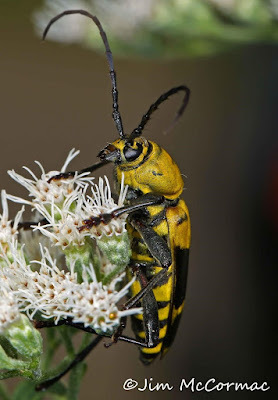 The wasp family Braconidae is immense, and undoubtedly includes scores of species as yet undescribed. I have no idea what species these wasps are, or even the genus. 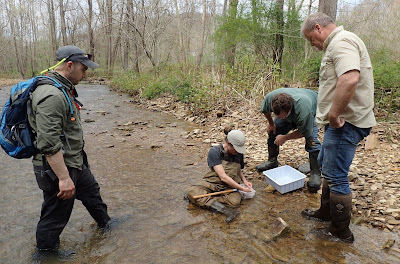 Identification of species in this group is the bailiwick of specialized experts, and I suspect specific identification isn't even possible in most cases without a specimen in hand. If anyone reading this can shed more light regarding identification, please let me know. I captured this wasp just as it was ready to take wing. Note the dark stigma along the leading edge of the forewings. A fate such as documented above is very common in the caterpillar world. Those of us who regularly hunt for caterpillars are quite used to seeing victims bristling with wasp cocoons, and/or the shells of empty tachinid fly eggs stuck to their exteriors. Very little in Nature is Disneyesque. Mark your calendars for Saturday, August 27. That's the date of the 5th annual Ohio Sustainable Landscapes Symposium, hosted by Dawes Arboretum. The sprawling arboretum, located near Newark in Licking County, is a beautiful place to visit at any season and is the venue for the symposium. Keynote speaker is John Watts, resource manager for Franklin County Metro Parks. John has been a driving force behind much of the park district's large-scale wetland and prairie restoration. Following the speakers, field trips will visit various habitats within the arboretum. It's sure to be an interesting and educational event. Mothapalooza 2016 a big success! Last weekend saw the 4th annual iteration of Mothapalooza, an event that has developed a strong following amongst natural history enthusiasts in its few years of existence. Over 160 attendees were present, and we filled the entire Shawnee State Park lodge - all 50 rooms and 25 cabins for the entire weekend. Mothing ecotourism, imagine that. This year we had people from eleven states, and Canada. The attendees who came the furthest hailed from Mission, Texas - over 1,200 miles as the moth flies (and not many can fly that far). A star-studded cast of luminaries of the entomological world were with us, including Doug Tallamy and some of his students. Seabrooke Leckie, coauthor of the 2012 Peterson Field Guide to Moths of Northeastern North America was in the house, and new for this year was the inimitable Sam Jaffe, founder of the Caterpillar Lab in Keene, New Hampshire. Steve Gettle, one of North America's leading natural history photographers, was also there. Entomologists of top caliber, such as Dave Horn, Dave McShaffrey, Diane Brooks, Mike Gilligan, Derek Hennen, Rachel Shoop, Greg Raterman, Linda Romine, and Candace Talbot provided expertise in the field. Mothapalooza has much help from sponsors, including the Ohio Division of Wildlife, Cedar Bog Association, Midwest Native Plant Society, Cincinnati Museum, Flora-Quest, Wild Ones, National Wildlife Federation, Ohio Prairie Nursery, Crane Hollow Preserve, Ohio Lepidopterists, Monarch Pathways, Ohio Chapter of The Nature Conservancy, and National Moth Week. The cast of volunteers is huge, and this lot includes many experts in the field of lepidoptera who generously donate their time. Logistics at this event are rather bizarre, with field trips departing on Friday and Saturday nights around 9:45 and often the last groups roll in around 2:30-3:00 am. Coordinating the complexities with precision is Mary Ann Barnett, our conference CEO. She puts in TONS of work to see that Mothapalooza sails smoothly. Following is the list of people who serve as invaluable volunteers and I hope I don't miss anyone! Kyle Bailey, Kim Banks, Mary Ann Barnett, Chris Bedel, Craig Biegler, Maria Bon, Natalie Boydston, Deb Bradley, Diane Brooks, Kay Clark, Jim Davidson, Jen Dennison, Nate Donat, Judy & Francis Ganance, Ann Geise, Steve Gettle, Mike Gilligan, Derek Hennen, Scott Hogsten, Dave Horn & Roz Horn, John Howard, Sam Jaffe, Olivia Kittle, Amanda Kriner, Jason Larson and his crew, Seabrooke Leckie, Bethany Linert, Katie Lloyd, Martin McAllister, Rich McCarty, Jim McCormac, Kathy McDonald, Dave McShaffrey, Gina & Tom Patt, Greg Raterman, Linda Romine, Elisabeth Rothschild, Marcey Shafer, Colleen Sharkey, Rachel Shoop, MaLisa Spring, Candace Talbot, Doug Tallamy, Brad Von Blon, Robyn Wright-Strauss, and Mark Zloba. The bread and butter of Mothapalooza is the mothing stations, which are placed in the wildlands of the sprawling Shawnee State Forest and adjacent Edge of Appalachia Preserve. By illuminating sheets with specialized lights, moths are drawn in, sometimes in large numbers. This is a station high on a Shawnee ridge known as Copperhead Lookout. Via a sophisticated transportation system of shuttles coordinated by Elisabeth Rothschild, participants are ferried between stations. As nearly everyone who attends Mothapalooza has some sort of camera, there must be many thousands of moth photos taken over the weekend. Moths are wonderful subjects. This is a Tuliptree Beauty, Epimecis hortaria. Blackberry Looper, Chlorochlamys chloroleucaria, which is about as large as your thumbnail. Cherry Scallop Shell, Hydria prunivorata, with its intricate pattern of wavy lines. Head on with an Isabella Tiger Moth, Pyrrharctia isabella. It's caterpillar is far better known than the moth - the Woolly-bear. The giant silkmoths always are crowd-pleasers, and this Regal Moth, Citheronia regalis, is among the largest of this crowd. Luna Moths, Actias luna, are always popular. Sharp-eyed Dan Kenney found this one in the darkened forest while exploring near one of the mothing sheets. It is a female, as evidenced by the skinny antennae. Another giant silkmoth, this one called the Tuliptree Silkmoth, Callosamia angulifera. It is a male, as easily told by its giant fernlike antennae. Sphinx moths are always a highlight of the mothing sheets, and we get nice numbers and diversity of sphinxes. This one is a Laurel Sphinx, Sphinx kalmiae. All moths are intricately beautiful upon close inspection, but some are exceptional. This is a Pink-bordered Yellow, Phytometra rhodarialis. The caterpillar of this species, the Funerary Dagger Moth, Acronicta funeralis, is one of the Holy Grails, the Paddle Caterpillar. I've written about this cat HERE. The Hebrew, Polygrammate hebraeicum. Moths such as this, with incredibly intricate patterning, make for fun macro portraits. You should be able to find a face or two hiding among the lines. Always popular is the Zebra conchylodes, Conchylodes ovulalis. I could and should do a specific post on this little beauty, the Sooty-winged Chalcoela, Chalcoela iphitalis. Its caterpillars parasitize the larvae of paper wasps!! The Crocus Geometer, Xanthotype sospeta, is rather butterfly-like in appearance. 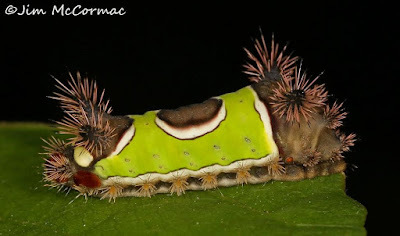 A fabulous bird-dropping mimic, and there are many rivals, is the Schlaeger's Fruitworm Moth, Antaeotricha schlaegeri. From afar, this mating pair resembled a fresh sparrow splat. Looking like little more than an old piece of dead plant matter is the Coppery Orbexilum Moth, Hystrichophora loricana. It was a target of one of our daytime field trips. This species is very rare, only known from three states I believe, and only where its host plant, Scurf Pea, Orbexilum onobrychis, occurs. Robberflies have little concern for rare species, and this Efferia aestuans robberfly has taken out and is eating the aforementioned Coppery Orbexilum Moth! Caterpillars face their own perils. We found this Saddled Prominent, Heterocampa guttivitta, being attacked by Formica integra ants on another daytime field trip. Everyone loved Sam Jaffe and were dazzled by his knowledge. I was fortunate to spend field time with him on the Thursday before the conference began, and was amazed at how he would find caterpillars from clues left by their feeding habits. He spotted this tiny early instar Red-spotted Purple caterpillar, Limenitis arthemis, a long ways off. Sam also brought along some wonderful caterpillars to share with the group, including this Northern Thorn, Selenia alciphearia, which is an outstanding stick mimic. Several of the bizarre Monkey Slug caterpillars turned up on field trips. It morphs into the Hag Moth, Phobetron pithecium. Looking for caterpillars is nearly as much fun - if not more - than watching the moths at the sheets. This spectacular Io Moth caterpillar, Automeris io, was found by Dan Kenney and his blacklight flashlight near one of the sheets. We're still sorting out details and dates for Mothapalooza '17, and I'll report on that when all is settled.